Samin Son is a Korean-born artist, currently based in Wellington. His practice traverses different mediums - painting, installation, sound and video - with performative strategies. 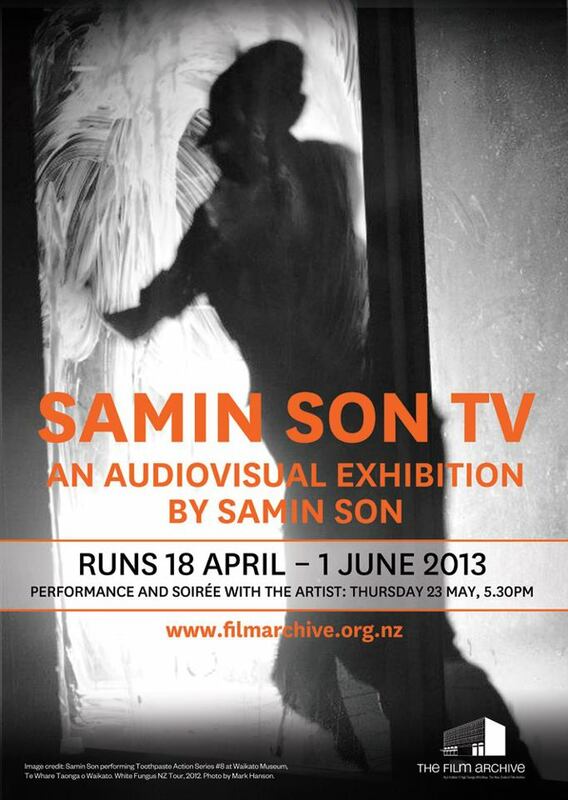 In Samin Son TV he reinterprets his past performance pieces as an experimental audiovisual work. The work is formed by his experience of compulsory military service in the Korean Army. He draws upon the endurance and meticulously directed aggression demanded by army life, as well as his struggles with identity and race politics in his second home. In the army Son had to suppress his non-conformist personality in favour of rules and rigidity. This resulted in an overenthusiasm for the mundane - a pushing of the limits of conformity to their threshold. In Samin Son TV Son revisits and reflects on his ongoing Toothpaste Action Series, which he has performed internationally. Toothpaste Action Series takes a subversive look at the daily routine and rituals required over his two years of service for South Korea. “In the army I trained for the riot police, had faeces thrown at me and entered real life riot situations. To toughen me up for the experience, my senior officers would beat me. I had to clean the bathroom floor everyday using toothpaste,” says Son. For Samin Son TV he has composed a narrative from recordings of his performances, including Toothpaste Action Series and Hammer Piece (in which the artist hammers through a plank of wood), and paired this with experimental film and sound strategies. Approaching the work as a video artist, Son teases out the themes that have been expanding and unfolding across his performances in a collective manner. Looking back at recordings of himself, Son is particularly interested in the idea of the “flashback.” “I invite the audience to engage in having flashbacks of my performances, to reflect my original experience from the conscription and the process this gave birth to,” he says. Son has exhibited his work and travelled his performance pieces widely throughout New Zealand and internationally - in Germany, the US, Taiwan, Seoul and Tokyo. There is no official opening function for this exhibition as Son will be jetting to San Francisco for a month-long residency with the Kadist Art Foundation, which he is undertaking as part of the White Fungus collective. Instead a performance piece and soirée with the artist will be held at the Film Archive on Thursday 23 May, at 5.30pm. The exhibition will run from 18 April until 1 June 2013. Samin Son TV is curated by Jakki Galloway.